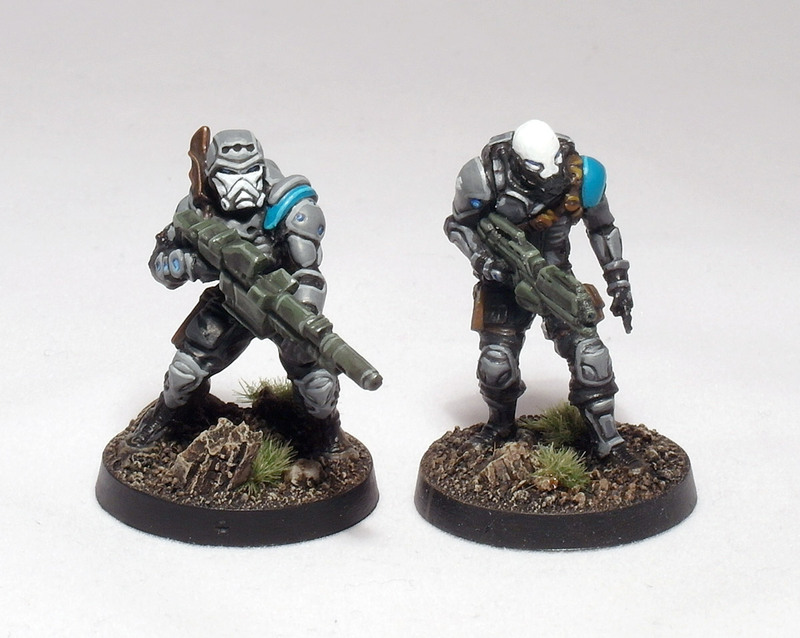 The Haqqislam models in my collection derive their colour scheme from my old Space Marines. The grey areas are painted with Mechanicus Standard Grey, washed with Nuln Oil then re-highlighted with Mechanicus Standard Grey, Dawnstone, then Fortress Grey. Weapons are painted with Tamiya Olive Drab, washed with Nuln Oil then highlighted with Olive Drab and a 50/50 Olive Drab/white mix. The turquoise parts are painted with Hawk Turquoise then highlighted with a 50/50 Hawk Turquoise/white mix. Lenses etc are painted in Cote D’Arms Marine Blue then highlighted with Cote D’Arms Prussian Blue.